Our one-way itinerary from Vancouver to Whitehorse takes you to unexpected places and encompasses two ferry rides along with the best of Canada’s spectacular outdoors. Take the road less travelled and explore the northern part of Vancouver Island where the adventure of a lifetime awaits you. Explore an unspoiled and breathtaking palette of rainforest, lakes and saltwater inlets while getting up close and personal with whales and sea wildlife. Then jump on a ferry to continue your exploration north along the Stewart and Cassiar Highways. You’re in for a memorable ferry ride today – enjoy the gulf islands, salty ocean breeze and keep your eyes peeled for orcas. Explore Nanaimo, “The Harbour City”, renowned for its excellent waterfront shopping, dining, vibrant arts and cultural scene. Enjoy your drive today along the scenic coastal highway 19A and stop in Fanny Bay, downtown Courtenay, visit Cumberland or drive up into the alpine of Mount Washington. Leave the hustle and bustle behind and drive two hours north through the untouched wilderness of the most northern part of Vancouver Island. Spend the next two days exploring the quaint surrounds of Telegraph Cove. Continue your journey north-west on Highway 19 to Port Hardy. Sit back, relax and enjoy the magnificent views of British Columbia's Inside Passage as they pass you by on the ferry from Port Hardy to Prince Rupert. Activities in the Prince Rupert area include hiking, wildlife watching, fishing and boating. The land option (Highway 16) will take you inland to Kitwanga where you can join the Stewart-Cassiar Highway through to Meziadin Junction. Today is all about the scenery. Be sure to have your passports on you, as the journey requires a border crossing. The spectacular scenery continues today as you drive between Meziadin Junction and Dease Lake. Be aware that services are not plentiful so take the opportunity to fill your gas tank whenever you can. It’s a 500km drive ahead of you today, which you might like to break into two days if you like to take time out to explore and hike. The scenery won’t disappoint. Today’s drive is all about the scenery on your way to Alaska. Keep your eyes peeled for wildlife, particularly bears. The number one attraction in Skagway is undoubtedly the White Pass & Yukon Railway. The train excursion will take up only a half-day - be sure to book well in advance. Time this morning to explore more around the town of Skagway before catching the noon ferry to Haines. Make a reservation online to ensure availability. The 240km journey to Haines Junction today will take you back into Canada and landing you on the edge of Kluane National Park. In the front ranges, you can enjoy casual strolls or challenging day hikes. If you are planning to drop off your RV today in Whitehorse, plan to get an early start. It’s less than two hours to our Whitehorse location. If you have another day, Whitehorse is an easy town to negotiate with an RV. You’re in for a memorable ferry ride today – enjoy the gulf islands, salty ocean breeze and keep your eyes peeled for orcas. The Tsawwassen Ferry to Duke Point is the best choice for reaching Nanaimo quickly. The ferry ride is about two hours long. If the weather is fair, there is nothing better than to stand out on deck while watching the landscape of the coastal mountains go by. Drive a short distance to the Qualicum Beach Region - Canada’s beach playground - with miles of sandy beaches. Take a day trip to Horne Lake Cave Provincial Park and explore the fascinating geology and history of the amazing caves or try skydiving with SkyDive Vancouver Island for a tandem flight over the ocean, mountains and valleys. Drive one and a half hours north on the scenic coastal highway 19A and stop for oysters at Fanny Bay, enjoy the hub of arts and culture downtown Courtenay, visit Cumberland a former historic coal mining town or drive up into the alpine of Mount Washington for a spectacular view over the Comox Glacier and the Straight of Georgia. Campbell River the "Salmon Capitol of the World" offers exceptional whale, bear and wildlife watching. Spend some time watching the fishermen bring in their catch at the wharf or enjoy the 4km beachside seawalk. Leave the hustle and bustle behind and drive two hours north through the untouched wilderness of the most northern part of Vancouver Island and step back in time when you reach Telegraph Cove. This historic and picturesque waterfront village is among the last surviving boardwalk communities on the west coast and deserves a longer stay. You have the opportunity to kayak with the whales on day or multi-day tours, or explore famous Knight Inlet and perhaps see grizzly bears in their natural environment. Drive out to Nimpkish Lake and get into the most exciting sport of Kitesurfing. With steady winds this is the best place to learn. RV Parking is available on site. Just a short boat ride away is Alert Bay, on Cormorant Island. The village is home to the world’s tallest totem pole, where more than half of the village’s residents are First Nations people. Go whale watching in the serene waters of Johnston Strait and the Broughton Archipelago Marine Park, one of the most predictable places to see killer whales in the wild. Hike the Blinkhorn/Dave Farrent Trail with amazing views over the ocean, or visit the Whale Interpretive Center. You have the opportunity to kayak with the whales on day or multi-day tours, or explore famous Knight Inlet and perhaps see grizzly bears in their natural environment. This small town at the northern tip of the island welcomes you with a hand-carved wooded sign at the edge of the town. Topped with wooden sculptures of bears and salmon, the sign reminds you of the many activities available to those who wish to stay a while. Take some time and join a guided hike with Cove Adventure Tours to experience some remote white sandy beaches, caves and the rugged northern backcountry. From Port Hardy, you'll continue your journey north by sea through the inside passage, enabling you to sit back, relax, and watch the spectacular scenery from the comfort of the ferry. Note that the ferry to Prince Rupert doesn't sail every day, so make sure you have your reservations made well in advance. Check the BC Ferries website for the most up-to-date information. The ferry arrives in Prince Rupert late evening so be sure to book your RV site in advance. Many campgrounds in Prince Rupert stay open late for ferry arrivals. Activities in the Prince Rupert area include hiking, wildlife watching, fishing and boating. A short distance away, in Port Edward, visit the North Pacific Cannery National Historic Site, the longest running cannery in BC's history. Almost 90 years of continuous salmon production and fish processing ended there in the late 1970s and the site has been preserved as a museum. Spectacular scenery abounds and there's always the possibility of viewing bears, moose and other wildlife en route. There's a great provincial park campground at Meziadin Junction where we recommend you spend a couple of nights if you have the extra time. Book in advance, especially if you're looking for a lakeside site. Today is all about the scenery. Be sure to have your passports on you, as the journey requires a border crossing. There is no US border inspection station here, making it the only land border crossing where a person may legally enter the United States without reporting for inspection, however you will need a passport to re-enter Canada. The road from Meziadin Junction to Stewart, known as the Glacier Highway (37A), takes you past more than 20 glacier formations including Bear Glacier – a must-see for every visitor. Bears, moose, fox, porcupine and mountain goats frequent the area. The 65km highway is completely paved. Just past Stewart is Hyder, across the border in the USA. Stewart is a small service town sitting at the head of the Portland Canal. The canal forms a natural boundary between Canada and the USA. One of the main attractions is the drive to the Salmon Glacier and Granduc Mine. Unfortunately this road is not suitable for large vehicles such as RVs. If you wish to travel the Glacier Road, check with Seaport Limousine in Stewart to see if they offer tours. Another big tourism draw here is bear watching. Three miles north of the town, the Fish Creek Wildlife Observation Site offers safe viewing platforms for visitors to view bears in their natural habitat as they fish for chum and pink salmon in the waters of the Fish and Marx Creeks. The bears frequent the area from June to September. Return to Meziadin Lake Campground for another night by the lake. You will pass more provincial parks en route, many of which offer great opportunities for hiking and camping. Just north of Dease Lake you’ll find Waters Edge Campground. If you prefer to travel a little further than Dease Lake today and get a head start on tomorrow’s journey, consider Boya Lake Provincial Park for your overnight stop. There’s a beautiful campground here with sites right on the lake. Make sure you book in advance. Highway 37 takes you out to the junction with Highway 1 about 15 minutes west of Watson Lake. We recommend you take the 22km detour into Watson Lake to stock up on food and drink and to visit Watson Lake’s most famous attraction – the Sign Post Forest. The “Forest” began in 1942 when a homesick US soldier decided to add his home town sign of Danville, Illinois to a sign post showing the way to Watson Lake. Today, the Sign Post Forest has over 72,000 signs … and counting. Continue on to Teslin, home to the Inland Tlingit First Nations. Be sure to visit the Teslin Tlingit Heritage Centre and the George Johnston Museum. The lake itself is a popular destination for fishing and boating in summer months. Today’s drive is all about the scenery on your way to Alaska. Keep your eyes peeled for wildlife, particularly bears. Highway 1 continues along Teslin Lake then veers west at Johnsons Crossing. A little further on, you come to a junction at Jakes Corner where you can go northwest to Marsh Lake and Whitehorse (if you’d like to shorten your trip) or take Hwy 8 to Tagish and Carcross (en route to your destination of Skagway today). Continue towards Carcross and, at the junction of Highways 8 and 2, take the Klondike Highway a short distance north and you’ll reach the Carcross Desert. Often considered the smallest desert in the world, Carcross Desert measures approx. 1 square mile. Return to Carcross, a small community comprising fewer than 300 people, and stop to visit the Matthew Watson General Store, the oldest operating store in the Yukon. Continuing southeast on Hwy 2 towards Conrad and Fraser, there’s a number of scenic lookouts along the road, many overlooking lakes. Skagway is home to many gold-rush era buildings, which now form part of the Klondike Gold Rush National Historic Park. For a fun and entertaining way to learn more about Skagway, take the Skagway Street Car Tour. Hear local history from a professional guide, visit a lookout over the town, the Gold Rush cemetery and the start of the Chilcott Trail. Take a flight over famous Glacier Bay deep into the jagged Fairweather Mountain Range or join a guided bicycle tour, retracing the historic Gold Rush, coasting down the White Pass Summit. If you have an extra day to spend in Skagway or would like to do something other than the train trip and streetcar, consider a day trip with Alaska Fjordlines to Juneau. This gives you the best of the inside passage in just one day, including wildlife and whale viewing, a tour of Juneau’s highlights, exploring on your own and a trip to the Mendenhall Glacier before sailing back to Skagway. Check the CanaDream app for partner discounts. The trip takes only 45 minutes so there’ll be plenty of time in the afternoon to get acquainted with Haines. Haines has activities for the whole family including bike tours and rentals, fishing, hunting, flightseeing, golf, kayaking and rafting. Haines has activities for the whole family including bike tours and rentals, fishing, hunting, flightseeing, gold, kayaking and rafting. River rafting is also an option. The Tatshenshini River journey takes you through the ice age with glaciers, icebergs, wildflowers and wildlife. Kluane National Park is home to 17 of Canada’s 20 highest peaks. Much of the park is inaccessible by road, making it ideal for day or multi-day hikes, flightseeing and exploring by water. Let Kluane Glacier Air Tours take you on a spectacular flight above the world's largest non-polar icefields and circle Mount Logan, Canada's highest peak. Refer to our CanaDream app for details and discounts. If you are planning to drop off your RV today in Whitehorse, plan to get an early start. It’s less than 2 hours to our Whitehorse location. If you have another day, Whitehorse is an easy town to negotiate with an RV. Some suggestions for places to visit are Miles Canyon, Yukon Wildlife Preserve, MacBride Museum, S.S. Klondike, Yukon Beringia Interpretive Centre, Takhini Hot Springs, Yukon Transportation Museum, Kweanlin Dun Cultural Centre and Yukon Brewing Company. The Okanagan valley offers a tantalizing experience for anyone who loves fabulous wine accompanied by fine cuisine. This is a perfect opportunity to taste the global culinary infusion of locally grown products complemented with renowned Okanagan wines. With more than 150 wineries in the Okanagan region, our itinerary can only offer suggestions as to how to make the most of your RV wine tour experience. And please, no drinking and driving! You may be familiar with British Columbia’s Sea to Sky because it played a starring role when Vancouver was host to the 2010 Olympic Games. Known for its breathtaking views and Vancouver’s greatest backyard and playground, escape the city and explore the Coast Mountain Range in the towns of Squamish, Whistler and Pemberton. Enjoy 16 days exploring the beauty of Western Canada from the Pacific coast, to the Rocky Mountains, to the interior of British Columbia. This tour gives you a unique taste of some of British Columbia and Alberta’s most spectacular sights. British Columbia's Sunshine Coast is a rugged, secluded, marvelously laid-back area people instantly appreciate when they make the journey. It stretches from Gibsons to Lund in an approximate 180 kilometre-long collection of ocean-side villages, creating homes for unique waterside shops, friendly locals and the easygoing, coastal lifestyle. Experience the awe-inspiring beauty of snow-capped mountains, towering in glory as they reach out to embrace the sparkling expanse of the sea. Transport yourself to a place where the silence of the forest is broken by crunching snow and the occasional cry of a bald eagle. A place where the afternoon sun filters through the trees and warms your face, while your body revels in the exhilaration that is provided only by the most intense outdoor experiences. Enjoy ten days exploring the diverse landscape and culture of beautiful Vancouver Island. From rainforests to marshes, beaches to mountains, oceans, rivers and lakes, Vancouver Island is one of the world's premier locations for whale watching, birding and fishing. Your CanaDream RV is the perfect way to experience it all. The Pacific Coast highway is the ultimate west coast road trip. The beautiful thing about taking your holiday along the Pacific Ocean is the freedom to stop and take in the ocean breeze whenever your heart desires. Some of our favourite places to stop along this journey are the Redwood Forest, Cannon Beach, Mendocino and Big Sur. Leisurely make your way down the coast and return to Vancouver via an interstate highway for a speedier trip back. The Golden Circle starts and ends in Whitehorse, taking you over a mountain to the Pacific Ocean and from a coastal rain forest to the world’s smallest desert. The Yukon has pristine rivers and lakes; endless forests teeming with wildlife; and a fascinating Gold Rush history that is so close, dance hall music can still be heard. 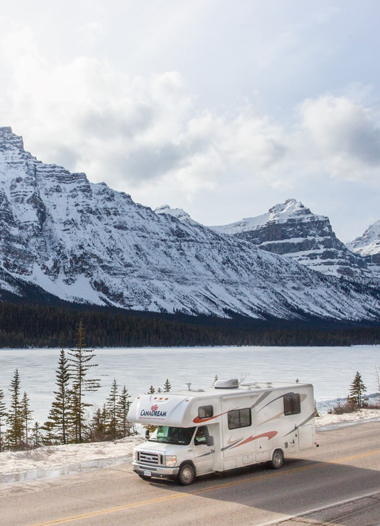 And anywhere there is a place to park a camper – whether it is in a natural Motorhome or RV park, or beside a stream with no name – a mountain view is practically guaranteed. So wonderful, so magical, the Northern Lights are a gift to those who live in Canada’s north and Alaska. This heavenly light show shoots green lights this way and red swirls that way as a curtain of white, shimmering light dances before you. And, when the conditions are just right, you can hear them crackle. On your journey from Whitehorse into Alaska, you might just be delighted with them nightly.